Franklin County Visitors Bureau highlights the 26th Jazz Festival on August 27 at Renfrew Park in Waynesboro. Franklin County Visitors Bureau invites the public to Renfrew Institute’s 26th annual Jazz Festival, scheduled for Sunday, August 27, from 2:00 to 4:00 p.m. on the lawn behind the Renfrew Museum house in Waynesboro, Pa. The concert features jazz greats, including Vincent Herring (alto saxophone), Conrad Herwig (trombone), Jared Gold (organ), Paul Bollenback (guitar), and Jeff “Tain” Watts (drums). The concert is free and open to free the public; donations are accepted. Renfrew Park features 107 acres of hiking trails, history, and a chance to explore nature. The park includes a nineteenth century German farmstead. 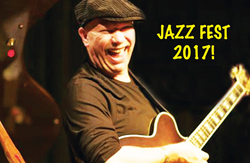 The Jazz Festival benefits Renfrew Institute for Cultural & Environmental Studies, which helps to connect people with the natural world and the rich cultural heritage of the region. Support for this event was provided by lead sponsor, FirstEnergy Foundation on behalf of West Penn Power. In addition, Renfrew Institute receives state arts funding support through a grant from the Pennsylvania Council on the Arts, a state agency funded by the Commonwealth of Pennsylvania and the National Endowment for the Arts, a federal agency. Further sponsors include Franklin County Visitors Bureau, Hamilton Nissan and Hamilton Hyundai, and Renfrew Institute’s Today’s Horizon Fund contributors: The Nora Roberts Foundation, APX Enclosures, and The Carolyn Terry Eddy Family: Carolyn, with daughters Connie Fleagle & Kim Larkin. Facility support is provided courtesy of Renfrew Museum and Park. Parking is available behind the visitors center, with additional parking in the lower lot off Welty Road. Those attending are encouraged to bring lawn chairs and blankets, and picnics are welcome. Rain site: Waynesboro Area Senior High School auditorium. The Franklin County Visitors Bureau invites all to explore Franklin County PA and enjoy the trails of history, arts and architecture, recreation, natural beauty, fresh foods and the warm hospitality of communities like Chambersburg, Greencastle, Mercersburg, Shippensburg, and Waynesboro. Franklin County PA is located just north of the Mason Dixon Line and is an easy drive to Washington DC, Philadelphia, and Pittsburgh. Discover more... plan a visit soon at ExploreFranklinCountyPA.com or by contacting 866-646-8060.